HORSHAM AIR GUARD STATION, Pa. -- Editor's Note: This is the second of a three-part commentary series about navigating through the Defense Travel System. In this installment, the author -- who has slightly increased her DTS proficiency since the first segment of the series -- concentrates on the DTS voucher process. Generally, my experience with all-engulfing angst is grappling through airport security with 80 pounds of military camera gear. A close second is completing my military travel voucher after a temporary duty assignment (TDY). For most, the former struggle is probably a non-issue, but perhaps the latter hits closer to home -- thinking of pending voucher vice and eliciting a groan of unease. Here's the good news: Most voucher woes can be mitigated with a little patience and know-how. If you've read the first part of this commentary series, then don't panic; you've already accomplished a major part of the voucher. If you haven't read the initial installment, feel free to panic slightly. Nevertheless, without examining the aforementioned article, there's still hope that you'll get your voucher paid out correctly. Whether the payout is nominal or phenomenal, keep reading for tips in making sure that your dough goes to its rightful place. "At the end of the day, it's money," said Tech. Sgt. William Estremera, 111th Comptroller Flight financial management technician. "Regardless of how much it is, it's money that's due to you and your travel card. Ultimately, it's just as important as your regular pay, it just requires more personal attention." Crack open that Defense Travel System (DTS). Again. Grab a snack, descend into your chair, use your common access card and log in to DTS. Go to the tab for official travel at the top of the screen. Then choose the vouchers option from the drop down menu. Look for the blue hyperlink that says, 'create new voucher from authorization/order' and click on it. Hint: That hyperlink is what lets you know you have vouchers to create. After selecting the trip that needs the voucher, click on the create option and go for it. "Provided that you did a pretty good job on your authorization, the voucher should be pretty straightforward," said Estremera. "As long as nothing happened differently than what was originally scheduled for the trip, you upload your documents and then you just click through until you until you get to the signature page." You nailed your original authorization, so doing the voucher is a cake-walk. Or is it? Here's the magic equation per Estremera: An on-point authorization prior to travel, plus an unaltered authorization during travel, equals an easy-peasy voucher after travel. But what if everything didn't go as planned? According to Estremera, all those changes can be made while constructing the voucher by merely editing the original authorization information to reflect the alterations you incurred during your TDY. Well, there's a caveat according to Staff Sgt. Rebecca Heidrick, who is a defense travel administrator here. "The one thing that you are going to change is the expenses portion. Any taxes you incurred - flight or hotel room - have to be added here and not rolled into what exists on the per diem page." In other words, separate your taxes and commercial travel office (CTO) fees from the overall cost of airfare and lodging. Insert those taxes and fees into the expenses section. "For example, the per diem page [of DTS] just has the room rate, but you're always going to be taxed or charged fees," said Heidrick. "Those taxes and fees aren't considered part of the per diem. So, if you want to be compensated for those taxes, they have to be noted in the expenses section." Oh, and don't forget your paperwork. DTS calls it substantiating documents, but this is just a fancy term for what is essentially your pay orders and receipts. These pieces of paper are important, though. So, let's break it down a little for clarity. - Certified pay orders -- not a draft copy - must be included. According to Estremera, they do not need to be signed. But, having a signed copy attached certainly doesn't hurt. - A lodging or hotel receipt must be included. - Even though airfare is booked through DTS, a receipt from that airfare must still accompany the voucher. If a member doesn't have their airline receipt, they can get a copy by going to http://www.mytripandmore.com. Using the member's last name and verification number, found and referred to as the PNR number on the DTS voucher, the receipt can be printed out. 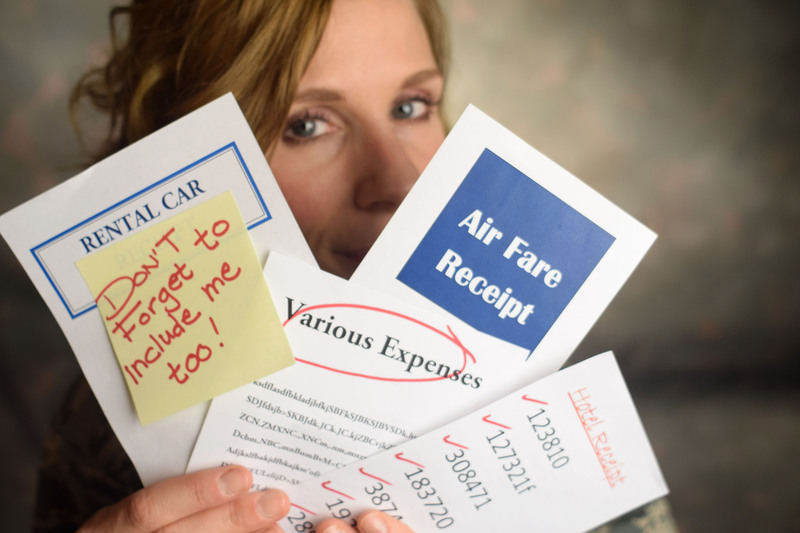 -Rental car receipts, if applicable, must be included. - Any expenses over $75 that a member wishes to claim must be accompanied with a receipt. These extraneous expenses include parking, taxi cabs, etc. Any reimbursable expense under $75 does not require a receipt. Items not considered reimbursable are fuel for personal vehicles; groceries; meals; miscellaneous supplies for work; cash dispensing machine fees; and currency conversion fees; laundry and dry cleaning to name a few. Hint: Many items that were formerly reimbursable are no longer. This is due to their inclusion into the member's general per diem of M&IE, which stands for meals and incidental expenses. If a member has a question as to what falls into this category, they are encouraged to contact their comptroller flight. Keep tabs on your tab. Due to the hefty amount of DTS documents processed through the finance office daily, it's recommended that members track the status of their own submissions. Estremera said that a member can go to DTS's voucher portion located in the official travel section to track down the voucher in question. By using the view or view and edit mode, a member can navigate to the digital signature page in order to assess the status of the document or, "where that document is sitting." This maps out the travel of the voucher through the approval chain and allows members to take action, if needed. If no action is needed by the member, then sit back, relax and watch your greenbacks route through the process. Then there are the usual suspects for voucher rejection. When asked, Estermera effortlessly rattled off a list of the major offenders when it comes to kicked-back vouchers. These nuances can convert to nuisances if members don't tackle them when first submitting the voucher. Here's a list of the top three offenders found within the 111th Attack Wing here: forgetting to upload pay orders, absent airline ticket receipts and not changing lodging entitlement to match lodging receipts. Estremera repeated that the lack of pay orders leads the pack in pickling a voucher in pending status. Although this is a lot of information to digest, Estremera stated that it's important that members complete the vouchers solo in order to become comfortable with the process. But he also warned that being overly confident can have its downside. "People sometimes go in and complete the voucher without really knowing what they're doing; they assume what they've done is right and don't check back." In summary, try to do your voucher so you learn how to accomplish it correctly, but don't just wing it and hope for the best. Estremera's final words regarding travel voucher turmoil? "People get frustrated with it, but it's super easy. It's so easy, but you have to pay attention."